The story tells of Edward and Alphonse Elric who lost their mother to an illness when they were young. With no father around the brothers do what should never be done with alchemy and attempt to bring their mother back to life. However, they fail and as with all alchemy of that level they also pay a harsh price for their attempt. Edward loses his left leg and Al loses his body and in an attempt to bring Al’s soul back, Edward pays the price of his right arm and manages to attach Al’s soul to a suit of armour. However this isn’t where our story begins. 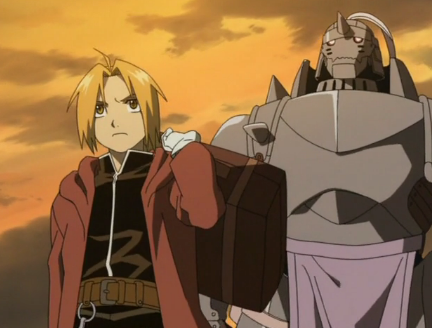 When we meet Edward and Alphonse for the first time the brothers are older and have set out on a quest to find the Philosopher’s Stone which they hope will allow them to bypass the rule of equivalent exchange in alchemy and allow them to regain their bodies. Edward is now working as a state Alchemist and the two brothers travel with one another on this quest meeting friends and foes alike along the way. It must be said that anyone thinking this story would be soft on Ed and Al after everything they’ve already lost is wrong. What’s interesting about Fullmetal Alchemist is the fact the world doesn’t treat the brothers any differently despite their harsh past. The world as we know it is a harsh place and the world which the brothers live within is no different. It’s no less brutal just because of what the two have been through, and in many respects that’s both pleasing and heart-breaking to see. Ed and Al are trying so hard to regain what they have lost and at times it’s almost unfair the messes they end up involved with, especially where the Military comes into it, but it never feels unreal or completely unfair because at the end of the day this is the price they pay for actions they take. Being a state Alchemist gave Edward the freedom to explore the Philosopher’s Stone, however he is a dog of the military nonetheless and often ends up in their messes. There are secrets within and not everything is as it first seems, but despite this Ed does have some friends among them. Roy Mustang is the guy in-charge of Ed and while to begin with you hate him almost as much as Ed does in the later episodes my respect quickly grew for him and his team. He might be one of very few who aren’t completely rotten to the core. Other than that a lot of the time we get to see Al and Ed’s childhood friend Winry who is not an unlikeable character by any means. The care she shows for Al and Ed is like a sister which is always nice to see. 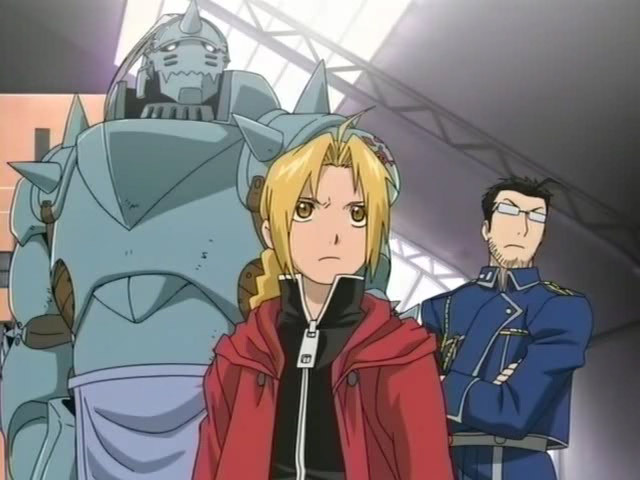 Being a 51 episode series Fullmetal Alchemist has more than enough time to introduce the viewer to a wide range of characters and it proves to be one of the things the show does extremely well; along the way Ed and Al run into a number of different people (both good and evil), and each is interesting in their own ways. I struggle to think of a weak character in the whole series, which is always a good thing and a strong achievement for a series of such length. What’s probably most interesting about the series is just how it uses each episode, having just over 50 to play with gives it more than enough time to explore a lot of the world Al and Ed live in as well as their backstories and the characters that spend a lot of time around them. Some episodes which may seem like filler early on or just seem utterly pointless are all actually part of a much bigger picture, and you can’t really judge fairly until you reach the end of the series and see how everything slots together so firmly. In terms of animation the series is certainly one of the best of its time, and despite being from 2003/4 (which some may regard as quite old now), it can certainly still hold its own against many series from the last couple of years. Studio Bones as always do a very impressive job in the animation and character designs overall and any viewer would be quite hard pushed to find fault with it. Admittedly, the animation is weaker than the 2009 Fullmetal Alchemist: Brotherhood series, but with such a time gap between that’s understandable and the plot of the original more than makes up for it. At heart the series also has an edge of comedy to it in order to lighten up some of the darker tones and as such we often get treated to chibis versions of some of the main cast during jokes most notably when Edward is having a go at people for calling him short (Edward also has the habit of mistakenly thinking he heard much worse comments on his height than just “short”, which always ends in great amusement for the viewer). When it comes to the overall soundtrack I’ve had the joy of watching the series both dubbed and with its original Japanese voice actors, and while I enjoy Vic Mignogna in the role of Edward Elric for the dub more than Romi Park in the Japanese, neither version has a weak point when it comes to voice actors and are both very enjoyable. Voice actors’ aside the series has an utterly thrilling soundtrack in terms of music with pieces that fit each scene perfectly and capture the emotion of the moment spot-on. I’m quite a big fan of anime soundtracks and honestly can’t say there are many that I enjoy as much as Fullmetal Alchemist’s. There are some truly lovely pieces dotted throughout the series and everyone will find at least one track they adore. With being such a long series, Fullmetal Alchemist went through a number of opening and ending themes, and a couple of ending themes aside pretty much every ending and opening fit perfectly. It may not be as shiny and new as Fullmetal Alchemist: Brotherhood, it may not have stuck close to the original manga story like Brotherhood, but all that aside Fullmetal Alchemist is still brilliant even today and is a must see for most anime fans.